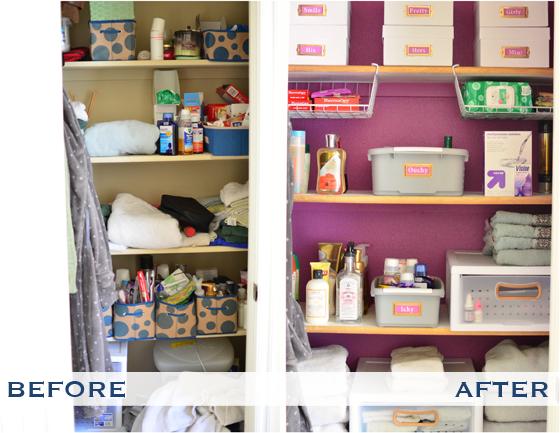 IHeart Organizing: Reader Space: Organized Closet of the Year! 18 Reader Space: Organized Closet of the Year! If you haven't heard yet, there is a new color in town and it is Radiant Orchid. When Pantone announced this "Color of the Year" I honestly didn't think twice about it because purple is not typically on my radar. That is, until I saw this amazing organized closet that completely knocked me off of my feet. 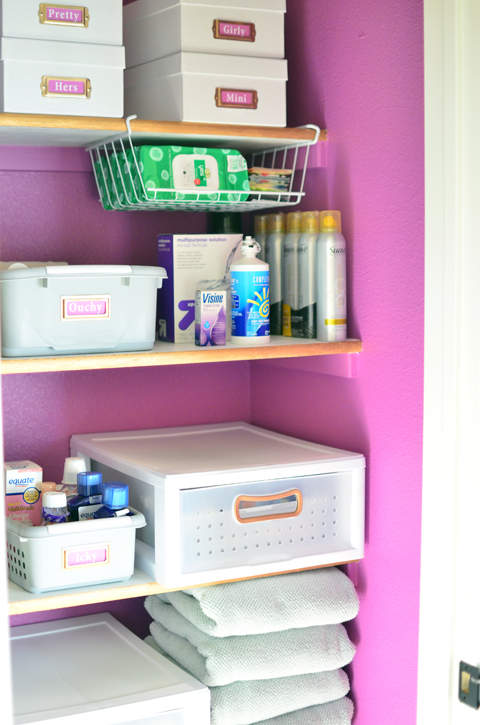 Melissa blogs over at A Prudent Life and recently tackled a bathroom closet project. Just wait until you see what a some thoughtful organizing injected with this amazing color did for this makeover. It has me rethinking so many areas around our home! Here she is now to share more with us! "Our closet has to keep up with multiple functions, which was part of the problem before. 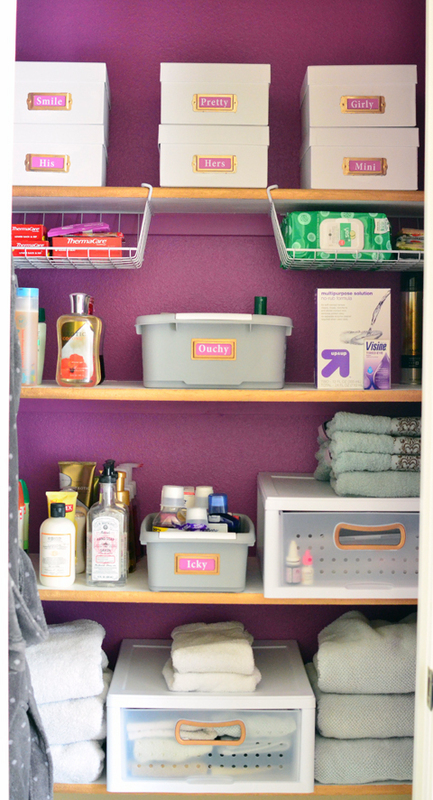 We need the space to hold towels, medicine, our mini-stockpile of toiletries AND the dirty laundry! " "I had to make sure the boxes & bins I used were big enough, but not too big. If you can fit your MINI Cooper in your new "organizing" bin, chances are you need to sub-divide it into smaller sections! I had some fabric bins before, but too much fit in each one AND they weren't labeled. Disaster combo! I also found it really helpful to purge some items out of the closet. Instead of having a ton of towels sprawling over several shelves, I picked 8 and moved the rest upstairs. It saved shelf space AND actually helps keep the laundry pile under control. When you have 467 towels, the laundry doesn't really HAVE to be done until you've used 466 and you're down to the last small, thin, old towel that no one really wants to use. Maybe we didn't have QUITE that many, but it sure felt like it before! 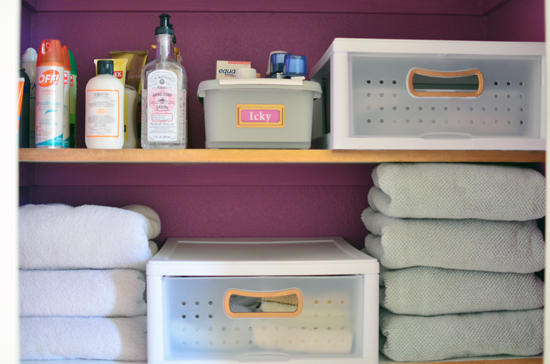 Now when my pretty towel shelf is half empty, I know I need to fill it back up again." 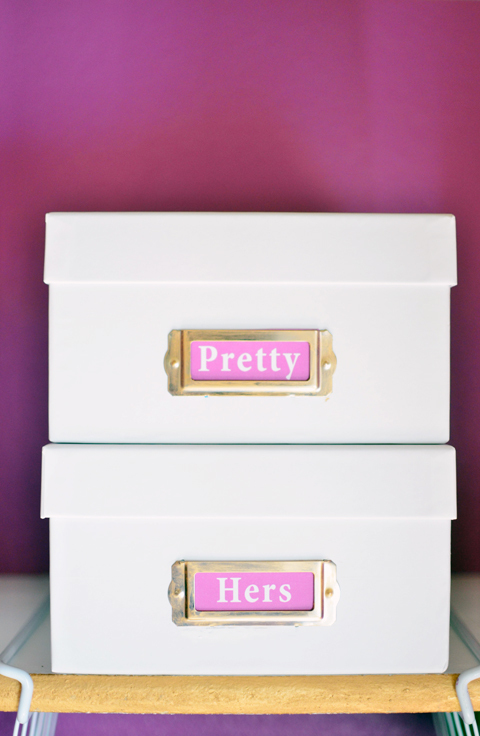 "The plastic drawers I stumbled on at Target were game changers. The one on the bottom shelf holds all the wash clothes and hair towels. Before, both those items were impossible to keep stacked nicely on the deep shelves. Now they are hidden, so if they fall over, who cares! And really, that doesn't happen because they are in an appropriately sized container. The drawer also serves as the perfect divider between stacks of bath towels. The hanging baskets were also vital. The shelves are spaced pretty far apart, and using the hanging baskets let me take advantage of the vertical space without adding new shelves. " "Making it pretty was really important to me, mainly because I know I am SO much more likely to keep things organized when a space is pretty. Some of the things that add to the "pretty" are the gold shelf edges & the color matched Radiant Orchid labels for the storage boxes. It was really awesome that Pantone published the color formula so I could easily print out the perfect color labels. Adding gold to the drawer pulls was also a fun touch, although I was terrified it wouldn't work and I'd end up with ugly drawers. And no one wants ugly drawers! " 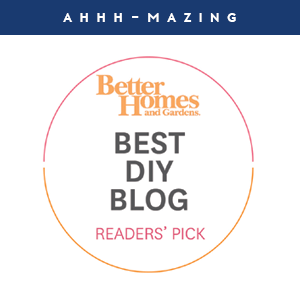 "I didn't have to DIY anything from scratch on this project, but I was able to add some flair to inexpensive purchased products to make them stand out. For example, I added gold bookplates to basic gray bins to dress them up. 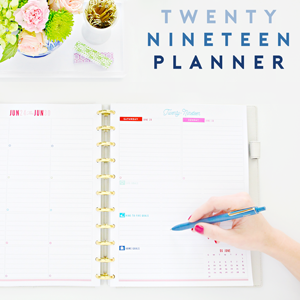 I think it's important to plan ahead when tackling a big organizing project. I knew I was going to attack the closet in January, so I was able to stay on budget by watching for sale & clearance items that could work together in the space. Each different type of container in the closet was purchased at a different store as I came across them in December. By the time I was ready to start, I had almost everything I needed and had gotten some great deals!" "It seems funny to say a bathroom closet could impact our life, but it really has! Grabbing a towel out of such an organized pretty space in the morning helps me start my day with a smile. Before the makeover, I started the day with fear of an avalanche! It has also been a financial win. I know what I need to stock up on during sales because I can see what I have on hand. It has also inspired me to continue working through the house, making each space as organized and pretty as the closet. " 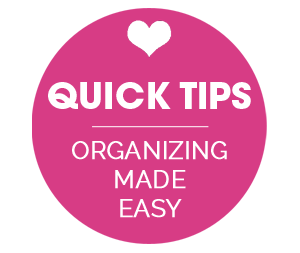 Such a great tip to divide down larger bins/organizers to maintain organization and prevent rummaging. Limit your towels my friends! More is not always better. That also means more laundry and more to store. 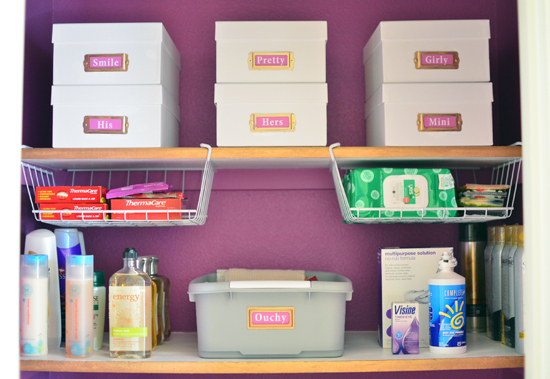 She used a great variety of supplies, based on the item being organized. Adding drawers to any closet is always a huge win! And I adore that her drawers doubled as dividers. 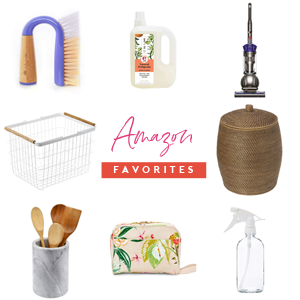 Photo/media boxes are always on my "Favorite Organizing Products" lists. There really isn't a single space I can think of where they can't offer up versatile storage. I loved that she planned out this purchase, budgeted for it and watched for sales. That way when she was ready to get started, she could dive right in! Her attention to detail is so inspiring! I love that she matched the pretty labels to the wall color, added special gold touches and really thought out the placement of the items. The end result makes her happy on a daily basis, completely making it worth her time and energy invested into the project. And she is organized and no longer over-purchasing which is now saving her money! 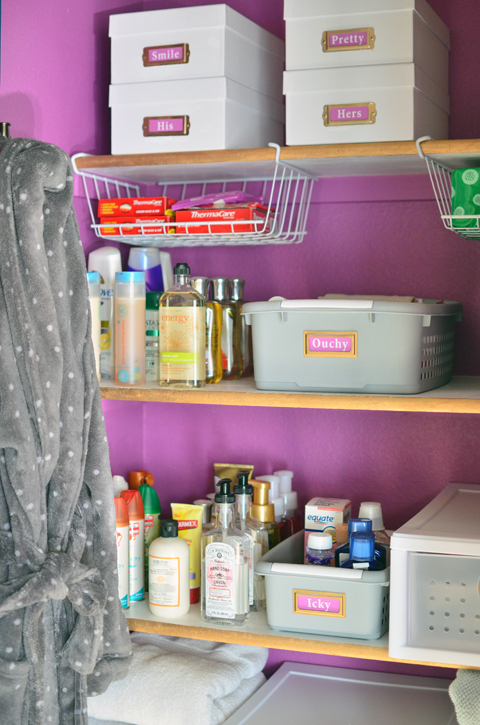 A huge round of applause to Melissa for finding inspiration in the Color of the Year and turning her bathroom storage into the Closet of the Year! If you are looking for more photos and project details, you can check out her blog here. 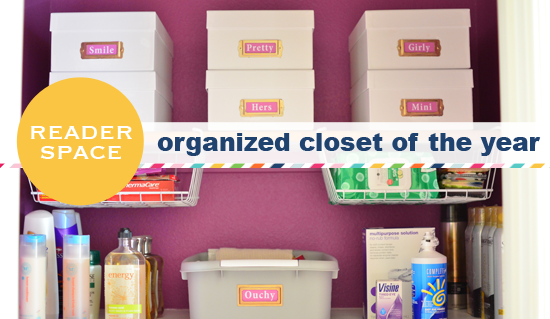 Have you injected Radiant Orchid or any other vibrant hue into your recent organizing projects? Bam! That's awesome! I'm not much of a color person but this space is really beautiful. Kudos Melissa! 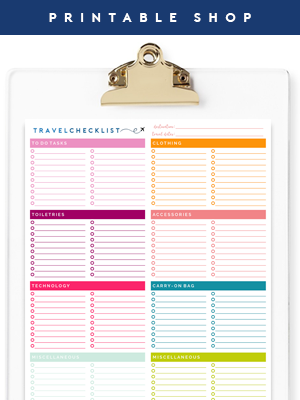 I really wish I was this organized! I try to be, I'm just not very good at it! Love it, looks great and that color is gorgeous! Looks great! Very organized. Not digging the color, but still very nice! This color looks amazing! I'm pretty partial to purples though. Great closet revamp! So pretty! I can't wait to organize our closet soon! I HAVE to do this!!! This looks amazing, thanks for sharing it with us! Looks great! She and I have the same bathrobe! I am in need of those shelf baskets. Love how this turned out! Very excited to see Radiant Orchid getting love! I work for X-Rite/Pantone and I love seeing this color every day at work!!! For some reason I have to see things, to realize what I need to do. I have so many places that need to be reorganized; I need to do a better job of keeping up with the spaces that I organize! I have some great ideas brewing for my closets now! I also like the cute labels titles. :) Before and After is always so inspiring. Makes me want to get busy cleaning, tossing and organizing. Jealous, our 1950's home doesn't boast such a nice bathroom closet. We've had to make a real effort to keep the kiddos mini closet organized.